I may have been lying to myself all these years. This is a serious issue. I write a lot of posts from a humorous angle, but don’t laugh. I’m not joking around. The realization of this issue has made me doubt all the things I believed to be true. I mean, if I’ve lied to myself, who can I trust? This one lie has made me think back on other lies. I don’t know what ideas were mine, or what ideas were put into my head. I don’t know what my favorite color is. I’ve thought a lot about this. Too much, maybe. When I was little, I loved Barbies. Barbies and pink. Barbies and pink, everything had to be Barbies and pink. And then Hello Kitty. Oh, going to the Hello Kitty store was heaven when I was seven years old! The smell of plastic and cheap lip gloss still gives me a thrill. When I turned ten, I met my friend Molly. We would play in mud, and catch lizards, and pretend to be cops and robbers. I learned what a tomboy was for the first time. And pink became the evil color. Soon, my bedsheets were blue, my clothes were blue, my stuffed animals were blue, etc. Blue was as far from pink as one could possibly get. Obviously. Then, around middle school, I discovered a book series that would change my life. It was called From The Files Of Madison Finn. She was a writer. She had a laptop. And the laptop was orange. Quickly, I realized no one liked orange, orange was neglected, orange was unique. I wanted to like orange. I wanted to be Madison Finn! Since then, I’ve told friends, and family, and the Internet that my favorite color is orange. I didn’t feel that it was a lie. I honestly love fall colors. But, looking back on my color-loving history, there have been serious influences. I can’t help but wonder what choices were really mine and which were thrust upon me or made up. What really is my favorite color? If I went crazy and was locked in a four-walled cell for the rest of my life, what color would I want the walls to be? I want there to be a psychological test you can take that measures the reflexes of your brain and tells you what color you really like. But that test would probably cost a lot of money, and knowing me, I’d rather spend it at Starbucks. This is my color story. What is your favorite color, friend? I still believe your favorite color says a lot about you. 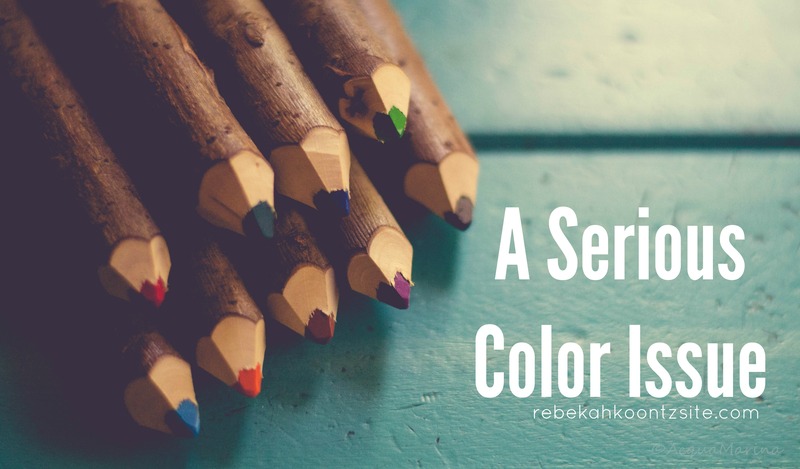 I suppose not knowing your favorite color means get-your-life-together-Rebekah. But I do want to leave you with this second question. You’ve told me what your favorite color is. . . But did you come up with it on your own? I’ve heard people say that before. Does that mean you wear like every color at once? I’m very intrigued! I love Teal! I’m wearing it right now! That’s kind of fitting for you to like those colors, I think, since your name is Jade! I believe I have three favourite colours. Light purple (can we still be friends!? ), turquoise and hot pink. Like you, I said orange was my favourite colour throughout most of my teens, and then I think I just realised… it wasn’t. I can never pick a favourite from the ones above, so I can only conclude that I like them all the same. Oh, the drama. *sigh* I suppooose we can still be friends. . . Lol JK! Of course we can! That’s so funny that you went through an orange period too! We are connected through the color orange. My favorite color has changed over time. As a kid: green. I was told that I couldn’t like pink, purple, or red, because they were girly colors. I had two electric green baseball caps that I liked wearing, until a girl at my summer camp said that she could see me coming from my “nerdy green cap.” So that ruined green for me. As a teenager: yellow. Bright, sunny, and I like daffodils. As a teenager, my parents allowed me to redo my room from the baby blue and soccer balls theme of babyhood, so I picked a pale yellow paint, with a brown and red Chinese symbol print border. I even found a maroon and yellow bedding set with bamboo shoots on it to continue the “yellow/brown/maroon Asiatic” theme I had going on. Ironically, I don’t like wearing yellow, because I feel like a giant banana. I liked yellow less after my cousin (who has the same name as me) declared it HIS favorite color. I still like my childhood bedroom though. As a young adult: red. Every college I went to has had red in it colors (UMass Maroon, Houston crimson, Wisconsin badger red). I have a red scarf that I wear at every opportunity, and a number of red appliances. Easy to find, plus they stand out, like my candy apple red vacuum cleaner, and a red couch cover. I had a red backpack for awhile, which I used until the bottom fell out. Now: I’m kind of back to green, I realize, as I sit here on my green-sheeted and green-comforted bed. Dark greens, specifically, are my thing; my winter coat is green, and when I got a new car, I searched and searched for a green one (alas, I settled on blue/black). My favorite drink is Perrier, in green bottles. Also, my late grandmother loved green and looked great in it, and I miss her. Never blue though; that’s my mom’s favorite color, and never purple, my sister’s favorite. As a child I was told that pink was a girl’s color; now that it’s returned in male fashion, I think it’s played out. Wow, that was a lot more than I was intending to write. It was fun…what’s the next book? Aww, thanks Dani! I just posted a follow up too. I absolutely loved reading your favorite color history!! You made me laugh when you mentioned not wearing yellow because you didn’t want to feel like a giant banana. I feel the same way about orange. I like it, but don’t wear it in it’s bright, “natural” form. You must make your grandmother proud, knowing you’re carrying on her love of green. Thank you for sharing that. It took me on an awesome little journey, and the long comment was amazing! Probably one of my favorite gifts I ever got my grandmother (and one of her favorite things too) was from my trip to Ecuador. She was pretty far gone into her Alzheimer’s at that point, and her main activities were sitting on the couch and watching TV, so I wanted to get her something functional, something that she could use and that might make her think of me. My host mother in the Andes had a little store in her home (like everyone else in the town) and to show my gratitude, I bought from her this beautiful, super-soft dark green alpaca wool blanket. When I came back, as I told my grandmother about the trip, I draped the soft blanket around her. She had one or two other couch blankets, but when she got cold and asked for a blanket, her caretaker always got the one I gave her first. After she passed away, I sort of selfishly wanted it back as a memento (and also because it was a beautiful and expensive blanket) but her caretaker, who is probably one of the nicest people on the planet and took care of BOTH my grandmothers before their deaths, wanted to keep it because it was so soft and still smelled like my grandmother, and I didn’t fight her on that one. And the next book will be discussed on Monday if you would like to join me in my epic read this weekend! It’s “Paper Towns” by John Green. I started this post thinking my favourite colour was blue and finished read this post not knowing if I actually believe myself anymore. Now I’m confused! Just an idea; what if it is more important to know what color one doesn’t like. Since that is the most consistent vaule in the equation. Maybe that tells us more about us than a favorite color. Or maybe a persons favorite color is the exact opposite if the color they dislike the the most on a color wheel. Just a thought. I absolutely love this theory. I think it’s very logical, and I never thought of it before! What is on the opposite side of the color wheel to light purple? I fully agree. My answer to this question is a confused face, a shrug and “monochrome colours”.